Senator Miriam Santiago's Enduring Humor To Be Immortalized In A Book Titled "Stupid Is Forever"
Senator Miriam Defensor Santiago is never boring. Wherever she goes and whatever floor or stage she stands on,she always makes sure that her audience aren't put to sleep. She raises her voice. She screams if she has to. She shakes her head. She points her fingers. She gets very animated. And of course, there's her trademark humor. The type of humor you would expect from someone with her education and background. Witty and often adorned with terms which the common man can only understand with the help of a dictionary or a thesaurus. Santiago also knows her audience well. She understands that she's talking to people whose levels of education varies and often steeply. That said, she can be referring to another politician as a pachyderm in a minute and then telling a rather cheesy pick-up line in the next minute. She can tell the right jokes to the right people and at the right time. In comedy, timing can be everything. And Santiago is very close to perfecting it. She is without a doubt one of the country's best humorists today. 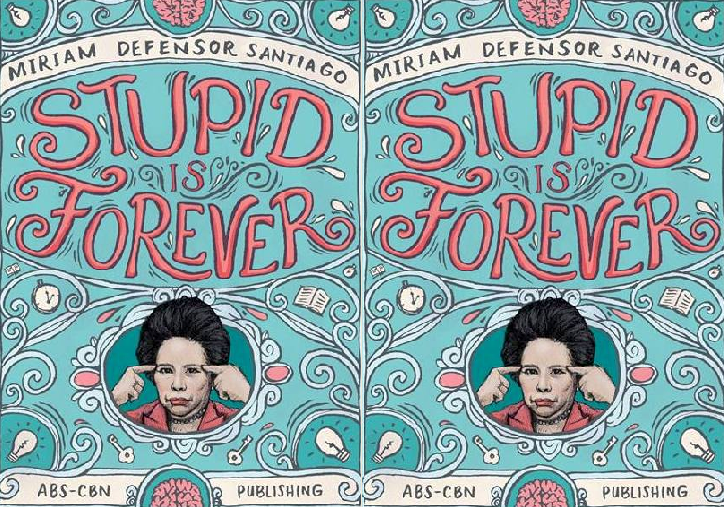 Next month, Santiago will reach another milestone in her side-career as a comedian with the publication of a book titled Stupid Is Forever. The book contains a collection of her most well-known one-liners, jokes, comebacks and speeches. The title is taken from here statement, "Ignorance can be treated, but stupid is forever", a line the Senator used during a hearing last year of the Pork Barrel case. Stupid Is Forever will be launched on December 3 at a branch of National Bookstore in Trinoma. A copy of the book will cost you Php175. This is not the first book that Santiago wrote. The Senator has written over two dozen books, most of which are on politics, law and philosophy.